I swore I wouldn't buy anything I didn't need, and I guess I don't actually NEED this jacket… but when I saw this jacket I did fall pretty hard. 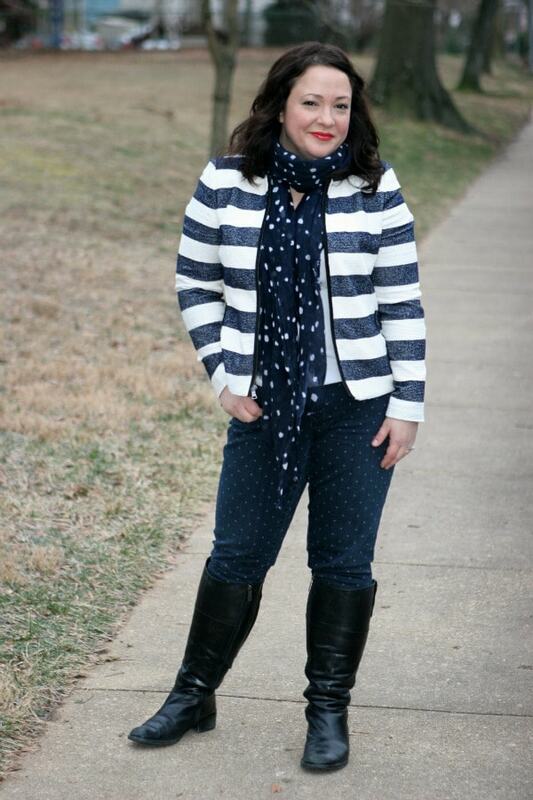 Dresses up and down well, the fabric makes it work year-round, I am on a mega navy kick, and it's striped! It's actually a very nice jacket – good details like the zippered cuffs don't unzip and have fabric behind them, hematite-colored zippers so you can wear with gold and silver jewelry, fully lined, and a good fit (I am wearing a 12 regular and it zips comfortably even over my bust). I know, I'm wearing gifted Gap jeans but that has nothing to do with this endorsement of the jacket, which I paid full price for (okay, I got 10% off since it was Tuesday and had a $10 rewards for being a Banana Republic cardholder). It's just pretty fab! What a fun outfit. Great inspiration. Love the mix of prints, looks great on you! I love the jacket but the jeans are what I covet! Current Gap? Yes! They are the Always Skinny Skimmer Jeans, new on the site. Stay tuned I’ll have a post just about them and showing how versatile and fun they are. Ankle length but not cheesy. Pleasantly surprised by them! 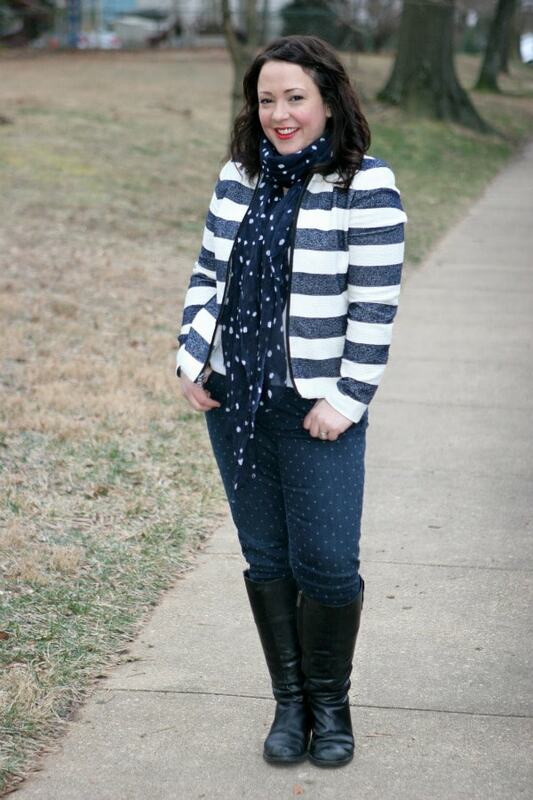 Love the jeans and the scarf. I like the mix of the pole dot sizes. 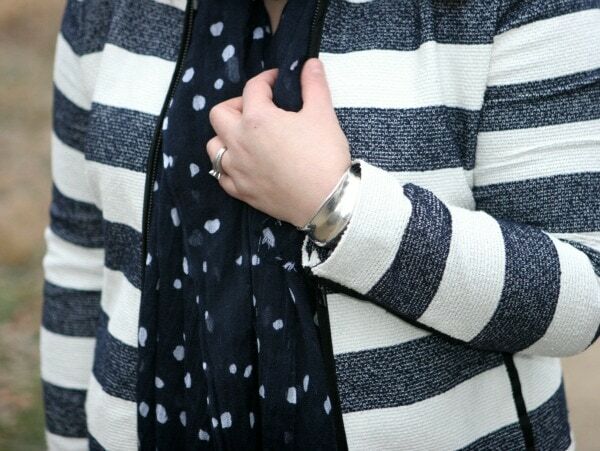 I think you nailed mixing stripes and dots! You look gorgeous. 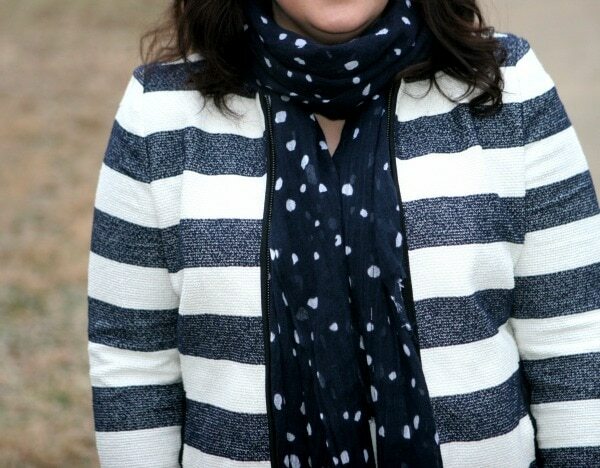 I love the combo of the stripes and dots and the jacket is just darling. It *is* fab – classic with a twist. And you look so pretty in it! I love — no, I covet — the jacket. I hope it shows up over here! Love — no, covet — the jacket! I hope it shows up over here! Gorgeous jacket! Makes me wish for spring!